If you’re like the majority of US homeowners, you use your garage for much more than parking your car. For some homes, the garage is a smorgasbord of tinkering space, storage closet, workshop, parking spot, and playroom. The garage is a useful middle-ground between an interior room and the world outside, perfect for messy work or bulky storage. You wouldn’t want to bring your bike inside every day, or to leave your table saw in the kitchen, but you also wouldn’t put either of those outside. Leaving your things inside and closing the garage door lets you protect them, from the elements and from thieves. But for an unfortunate development in Auburn, California, this wasn’t an option. There is nothing worse than an ugly garage door. Coming home every day should be a joy – but coming home to a garage door that you despise will only make you unhappy. Your home should be a safe and happy place for you, your own oasis in the middle of your life. Having an ugly, old, broken garage door certainly won’t help you feel that comfort! 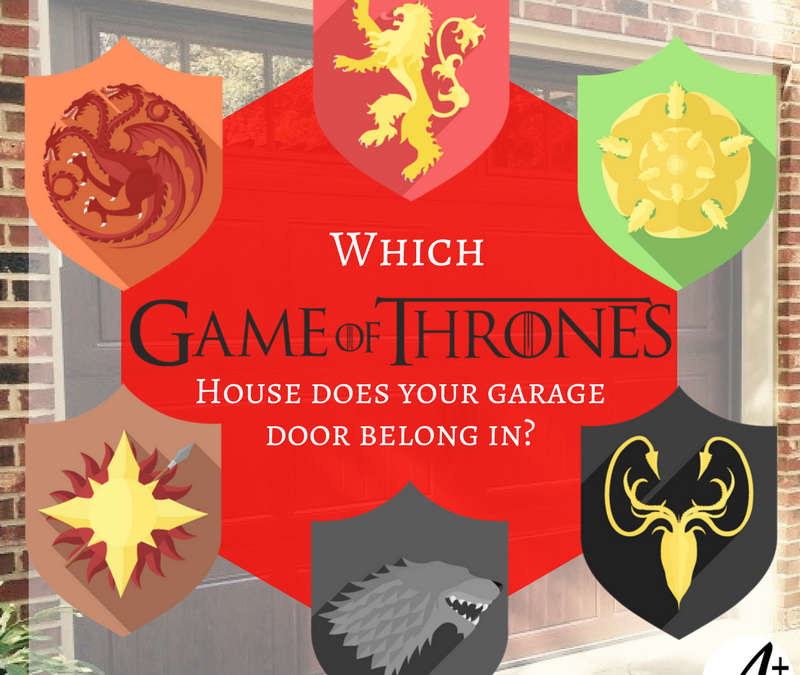 What GAME OF THRONES House does your Garage Door Belong in? Everyone likes a good secret – people love knowing secrets, or keeping secrets. Knowing something that other people don’t can be powerful, and of course it can be rewarding. But did you know that even now, your garage door is keeping secrets from you? That’s right – sitting out there in your garage is the key to saving money, staying informed about your home, or adding another whole room onto your house! Today, we’re going to pull back the curtain and pass along six juicy secrets about your garage door that you might not have known. What is your dream car? Have you always wanted a convertible sports car, or maybe an old-fashioned roadster? Having a garage stocked with rare and valuable cars is a huge status symbol, and it’s not surprise that some celebrities are notorious car collectors! Sometimes, it’s what’s behind the garage door that counts – and here’s a list of the top 8 celebrity garages! Every homeowner has certain rooms that they consider required. Parents with two daughters need three bathrooms. Larger families need a huge living room or open kitchen to congregate in. Some husbands want a basement for a mancave. The one thing that everyone agrees on, however, is that they need the right amount of house. So how much is the right amount of house for you? Odds are that you immediately start thinking in terms of thousands, but the modern trend towards minimalism is putting some people in home’s that are not even a quarter that size. The tiny house movement is exploding, and hasn’t shown any sign of slowing down – now, tiny homes are even coming with garage doors! How to Instantly Transform your Garage Door! How often do you notice a garage door? If you’re like most people, garage doors are probably practically invisible to you. You might notice a particularly ugly residential garage door, or if a restaurant has a commercial door installed on the front wall you might think about it for a moment, but if you see a totally normal garage door you probably wouldn’t think twice about it. What if we told you that there was a product that could change that completely, and make every visitor notice and remember your garage door? We like filling you in about new developments in garage doors and garage door openers, but we know that all that talk can get a little dry. Even still, the garage is one of the most iconic rooms in a home, and even just a mention of “garage door” gives you an instant image of what a garage looks like. Everyone knows that garages are used for parking cars, storing sports equipment, practicing with your band, or plying a trade like woodworking or auto repair. But despite how garages are typically typecast, they can be used for so much more – such as this Los Angeles-area garage that is the stage for a new and innovative play, “In Case of Emergency”. It is the season for pumpkins and apple cider, scary story and monsters, and also the season for a whole bushel of simple craft projects! We’ve created a list of some of our favorites over on our pintrest page, and if you’re looking for a way to decorate your home on a budget or just a way to stretch your creative muscles with a little project, we’ve got something perfect for you!